There is only one New Year’s resolution that works. That is when you resolve to take action towards your goals. Two of the top New Year’s resolutions are decluttering and organizing your home and losing weight. In the past I’ve made both of those resolutions many years in a row. I slowly got to a point where I felt I was fairly organized. The clutter wasn’t completely gone but it wasn’t overwhelming my day to day routines. However, I did need to constantly work at it to keep it that way. But life happens. Sometimes we get detoured from our routines. Our goals begin to feel like they are out of reach. When that happens all our hard work seems to go out the window. The clutter creeps back into our homes. The pounds creep back on our bodies. We get frustrated. We beat ourselves up for not staying with our routines. And sometimes we throw our hands up in the air and resign to the idea we are just incapable of reaching our goals of being organized, losing weight, or any other goal that eludes us. Beating ourselves up doesn’t help get us back on track. The only thing that helps is taking actions. So this year I have only one New Year’s resolution, take action everyday that moves me in the direction of my goals. You’ll notice I didn’t specify any particular goals or actions. We all know what goals we want. Whether it’s to lose weight, exercise more, eat healthier, clear out the clutter, get organized with our homes, papers, and daily lives, or to improve our relationships with family and friends. All those are good goals to work towards. But it’s the journey along the way that makes a difference as to whether we achieve our goals or not. And even once we achieve them it’s the daily actions, routines, and habits that will keep the end results where they are even when we move on to work towards new goals. So actions large and small are what counts. Actually many times it’s the small daily actions that build up to create the most success. The only problem with the small daily actions is many times we don’t see a large enough visible result to keep us motivated. One technique I use to resolve the motivation problem is to give myself “visual pats on the back”. I do this by using two simple tools, a wall calendar and stickers. The way it works is you decide what “action” you want to become a habit. I use different stickers for different habits I want to establish. It will also work for projects you want to work on. It will give you that “visual pat on the back” when you’ve been consistent in taking actions. If you notice a few days have gone by without any stickers that will alert you to the fact that you haven’t been taking those actions consistently. Then all you have to do is jump in on the current day and get back on track. Remember, it’s the consistent actions that will eventually help you reach your goals. This entry was posted in Calendar, Clutter, health, Organizing. Bookmark the permalink. I love this article. Especially loved the idea of using stickers to have visual pat on the back and the idea of building habits. I’m going to look at some habits I want to build then set up ways to put visual cues like stickers up to help me develop them. Thanks Devorah. 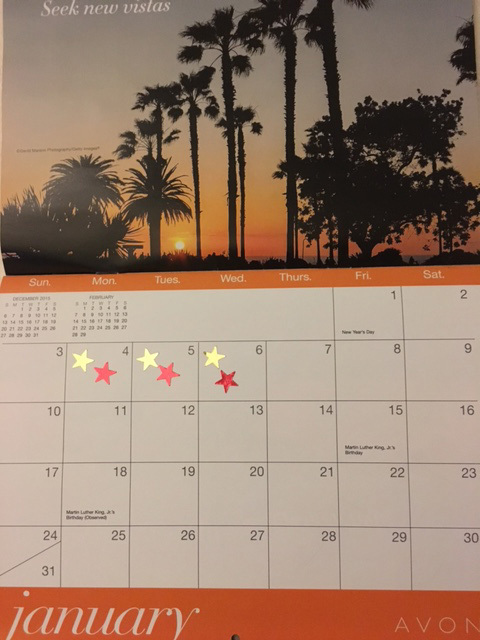 Any time I use the sticker/calendar to help develop a habit I have a much greater success rate. Many times when I get out of the habit of using the stickers the habit I kept track of with them also seems to disappear.